The social calendar of "Little Italy" was a busy one with many events taking place. In the first part of the year there were Italian dances, where the old and the young mixed together reminiscing of times gone by. These included the 'Befana' held on the feast of the Epiphany, the 'Rumpapagnata', and the 'Shrove Tuesday' dance. They were also an opportunity for Italian mammas to indulge in some matchmaking! Towards the middle of the year was the Manchester Whit Walks, the festa of the Madonna of the Rosary, a major public event for the community. At the end of the year was the children's Christmas party. Days out included the trip to the seminary at Pot Shrigley on the feast of Corpus Christi. 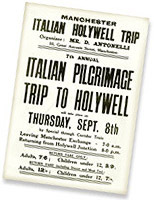 Italians from around the north west region would congregate for The Holywell and Pantasaph pilgrimage to the shrine of St.Winifred in North Wales. This would take place on the 15th of august and the 8th of September. Other events were children's parties at the home of the Italian consul. There was the 'Balilla' organisation for boys and girls, a kind of scout movement with Fascist ideology. They learnt patriotic songs, the Italian language, there were sporting activities and even trips back to the homeland which were sometimes funded by the Italian government. Baptisms, weddings and funerals were also great public occasions. Choosing godparents for an Italian family was taken almost as seriously as the College of Cardinals choosing a new Pope! Other important events were a child's first communion, first confession, and confirmation. Italian weddings have always been great occasions with all the memorable characters in attendance. They were mainly held on Tuesdays or Wednesdays, as weekends were important working days in the ice cream business. The wine flowed, the music played, the food was plentiful; all the 'paesani' were invited from far and wide, from Italy, the States, and almost every town and city in the UK where they had family and friends. It was not uncommon to see 300 people sat for the meal, and a further 250 at the evening reception. They were great events; the families wanted to show off how well they had done, a far contrast from their immigrant beginnings. With this community playing such a large part in the ice cream industry, many were members of the Ice Cream Alliance. They organised national competitions, exhibitions and social events. Men could also look forward to the annual men-only trip to Blackpool, which became notorious! 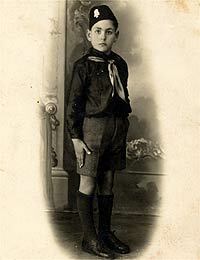 A proud Italian boy in his Balilla uniform, circa 1920s.